Looking for a male English UK narrator? If you think Ken could be the best voice-over for your project, use code ENUKM05 when filling out the form on the right to inquire about this voice talent. 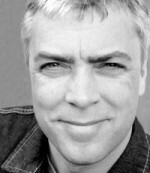 Ken is a British narrator and voice over artist based in London. He covers the age range 40's to 60's. He always sounds like he know what he's talking about even when he doesn't have a clue. Famous brands that have benefitted from his voice to grow just that bit more famous include Age Concern, Audi, BBC and Goretex, to run the gamut from A to G.
Ken's voice is also inside a variety of electronic gadgets, including a portable defibrillator. It's a sobering thought that Ken's may be the last voice you ever hear. "I've been listening through the full four chapters of Dracula. They are truly marvellous. I find myself gripped by your performance, even being well familiar with the text. It is such a perfect fit. I can't wait to release it!" "The final version is just brilliant, and I'm truly thrilled with it. Ken's voice is beautiful and just right." Use code ENUKM05 when filling out the form on the right to inquire about this voice talent.